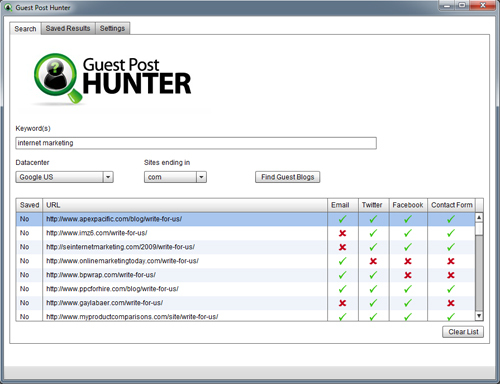 I got a review copy of Guest Post Hunter from Paul Clifford about an hour ago and I can tell you this is excellent software. It is very easy and straightforward to use. You simply enter your keyword into the software and click a button. The software will then scour the web for blogs related to your niche and that WANT your content. This allows you to find some excellent blogs in which you can get your articles published. It allows you to create exposure within your niche and spread your name around as an authority figure. It enables you to obtain FREE traffic directly from the blogs in which you post your content on. It is a great way to get VALUABLE backlinks! Probably the BEST kind of backlinks. The software will also tell you the various ways in which you can contact each blog owner, such as via mail, Facebook, Twitter or a contact form. You can then save whichever sites you like and send them an email from within the software. A great traffic generation tool that can also provide you with top quality backlinks. If link building or traffic generation is your “thing” then you should really consider jumping on this tomorrow (Friday 27th July ’12). I will email you as soon as this goes live. Paul is selling this software as a dimesale and the starting price is going to be $17 but that will increase with every sale. If you are wanting to buy this software then I recommend you jump on it as soon as possible because Pauls software sells fast. I will try and offer a bonus for those who purchase through my link. I’m not quite sure what it is yet but I have a few ideas! Keep an eye out for my email tomorrow, as I’ll let you know as soon as the doors open… this is one you do not want to miss!